Despite yesterday’s retreat to 102.09, subsequent rebound in Asian morning suggests dollar’s choppy consolidation below Wednesday’s high at 102.73 is likely to continue with neutral bias. A breach of 102.73 would confirm erratic up move from April’s low at 101.32 has once again resumed and extend gain to 103.06, however, loss of momentum should cap price at 103.39/40 today. On the downside, a breach of 101.86 would indicate the recovery from 101.32 is over instead and weakness to 101.50 and 101.32 would follow. As U.S. dollar rebounded after finding renewed buying at 102.04 on Monday in part due to renewed cross selling in Japanese yen, suggesting the pullback from last Tuesday’s high at 102.73 has possibly ended at 101.96 last Friday and a breach of aforesaid resistance would confirm up move from April’s low at 101.32 to retrace decline from April’s 2-1/2 month peak at 104.13 has resumed, yield further gain to 103.06 (61.8% r). On the downside, only a breach of 101.86/91 support area would prolong recent choppy consolidation and may risk weakness to 101.50 but 101.32 support would hold initially. The greenback traded narrowly on Thursday after Wednesday’s strong retreat from 102.67 to 102.03, however, as aforesaid sell off suggests recent up move from April’s low at 101.32 has formed a temporary top at 102.79 on Tuesday 102.79, choppy consolidation with downside bias would be seen and weakness towards 101.96 support (last Friday’s low) is likely, below would bring stronger pullback to 101.60/70, however, as broad outlook remains consolidative, April’s low at 101.32 should hold from here and yield further choppy gyrations. On the upside, only a breach of 102.67 would turn outlook bullish for another corrective rise to 103.06, being 61.8% retracement of 104.13-101.32, however, reckon upside would be limited to 103.30/40. Despite last Friday’s brief rise to 103.02 due to the release of upbeat US jobs report, the renewed tension in Ukraine knocked price lower to 102.13 and then 101.86 yesterday, suggesting the erratic up move from April’s low at 101.32 has possibly formed a temporary top there and consolidation with downside bias would be seen, however, breach of said sup needed to confirm decline from this year’s top at 105.45 has once again resumed and yield re-test of 100.76 (February’s low). On the upside, only a breach of 103.02 would prolong recent choppy consolidation and may risk stronger gain to 103.45 but res at 104.13 (April’s high) is expected to remain intact. Bank of Japan April 7-8 minutes stated that “most members agreed BOJ should continue with QE as long as necessary to meet 2% price target; one member said BOJ’s easing should be restricted to about 2 years; one member said speculation about protracted QE could lead to economic instability in the medium to long term; one member said corprate profits, employment and income are improving significantly. Dollar retreated after meeting renewed selling at 101.60 in Asian morning on Tuesday suggests the recovery from Monday’s fresh 3-1/2 month high at 101.10 has possibly ended and erratic decline from April’s high at 104.13 should resume for weakness to said level, below would encourage for a re-test of this year’s low at 100.76 (February). On the upside, only above 101.83 (being 38.2% are of intermediate decline from 103.02) would signal temporary low is made and risk stronger bounce to 102.12 and 102.36 resistance. The greenback extended up move from last Wednesday’s 3-1/2 month low at 100.81 to 102.14 on improved risk appetite due to dollar’s broad-based strength after the release of robust U.S. economic data, suggesting a stronger retracement of decline from April’s high at 104.13 would be seen and further gain to 102.36 resistance is envisaged, however, reckon 102.86 should cap upside and yield retreat later. On the downside, only a breach of 101.60 support would signal the recovery is over instead and may bring weakness to 101.35 support level.
. [B] USD/JPY - 101.74[/B]… The greenback weakened on Thur n ratcheted lower fm Australian high of 101.87 to 101.47 in European morning due to broad-based buying of yen. Price briefly fell to a fresh session low of 101.43 in NY morning after mixed U.S. economic data b4 staging a rebound to 101.79.
. Looking at the hourly n daily charts, although y’day’s breach of 101.64 sup signals recent upmove fm last Wed’s fresh 3-1/2 month trough at 100.81 has formed a temporary top there, subsequent rebound signals pullback has possibly ended n as long as 101.43 sup holds, upside bias remains for aforesaid upmove to resume, abv 101.98 wud add credence to this view as hourly macd wud have cut abv zero line on such move, then dlr will be en route to next daily chart obj. at 102.36. (May 13 high), n later to 102.86 next week, this is the ‘dynamic’ 61.8% r of the entire fall fm 104.13 to 100.81, in early Jun, however, as broad outlook remains consolidative, daily res at 103.02 (May’s high) wud hold.
. In view of abv analysis, trading dlr fm long side is still the favoured strategy today n only a daily close below 101.30 wud abort present bullish scenario n risk stronger retreat to 101.00.
. [B] USD/JPY - 102.49. [/B]… Although dlr retreated after an initial marginal gain to 102.65 in Asian morning, price retreated as the release of upbeat Japan GDP boosted demand for yen. Later, dollar weakened to 102.38 in European morning n then rebounded to 102.59 in NY morning b4 moving sideways in quiet NY afternoon.
. Looking at the hourly n daily charts, dlr’s strg rebound fm Fri’s low at 102.11 to 102.65 y’day signals pullback fm last Wed’s fresh 1-month peak at 102.80 has ended there n as the daily technical indicators are rising, suggesting upside bias remains for recent erratic upmove fm May’s 3-1/2 month low at 100.81 to resume n extend to 102.86 n then 103.02, being the ‘dynamic’ 61.8% r of the early fall fm 104.13-100.81 n May 02 high. Looking ahead, a daily close abv there wud encourage for subsequent headway twd 103.50 (being 80.9% r) but as mentioned in previous updates, we’re holding our view the broad sideways move fm 2014 5-year peak at 105.45 (Jan) is unfolding into a ‘triangle’ n pivotal res at 104.13 (possible B-leg top) wud continue to hold this month.
. Today, trading dlr fm long side for gain twd 103.02 is recommended n only below 102.11 wud confirm temporary is made n risk 101.57 (61.8% r fm 100.81).
. [B] USD/JPY [/B]- 102.20… Dlr found renewed buying at 101.82 in Australia on Tue n climbed to 102.07 in Asia as rise in the Nikkei boosted risk appetite. Later, dollar ratcheted higher in NY morning after release of higher-than-expect ed U.S. CPI data n rose to session high of 102.24 b4 easing in NY afternoon. high) suggests correction fm Jun’s peak at 102.80 has ended earlier at 101.61 last Thur n choppy trading with mild upside bias remains, abv res 102.42 anytime wud add credence to this view n re-test of 102.80 wud follow. Looking ahead, break of 102.80 wud confirm upmove fm May’s 3-1/2 month trough at 100.81 has resumed n extend twd 103.02, being the ‘dynamic’ 61.8% r of the fall fm 104.13-100.81, a daily close abv there wud encourage for further headway twd 103.50, however, as mentioned in previous updates, we’re holding our view the broad side ways move fm 2014 5-year peak at 105.45 (Jan) is unfolding into a ‘triangle’ n pivotal res at 104.13 (possible B-leg top) wud continue to hold this month.
. Today, trading dlr fm long side for gain to 102.55 is recommended n only a daily close below 101.43 (May low) wud abort bullishness on dlr n risk 101.10. The greenback remained under pressure after penetrating 101.61 support last week, suggesting the erratic decline from June’s high at 102.80 has resumed and further weakness to 101.00/10 is envisaged, however, previous key daily support area at 100.76/81 should hold on 1st testing and yield rebound later. On the upside, only a rise above 102.00 would prolong choppy consolidation and may risk gain to 102.35 resistance again. Dollar’s intra-day rally above October’s peak at 110.09 to a fresh near 7-year high of 111.53 in European morning after BoJ’s surprise easing confirms long-term uptrend has resumed and further gain to projected obj. at 111.98 is likely after consolidation, however, o/bot condition should prevent sharp move beyond there today and risk has increased for a much-needed retreat later. On the downside, only a daily close below 110.09 (previous resistance) would signal a top has been made and yield correction towards 109.47. The greenback swung wildly against the Japanese yen on Thursday. Despite hitting a fresh 2-week low of 117.45 in Tokyo morning on Thursday, dollar ratcheted higher and rose to 119.56 on active short-covering due to the rebound in Nikkei-225 index following the rise in U.S. stock markets together with upbeat U.S. retail sales data, however, profit-taking ahead of Japan’s election over the weekend knocked price lower to 118.51 in Asia today. Further choppy consolidation inside recent established broad range of 117.45-119.56 is expected to continue. 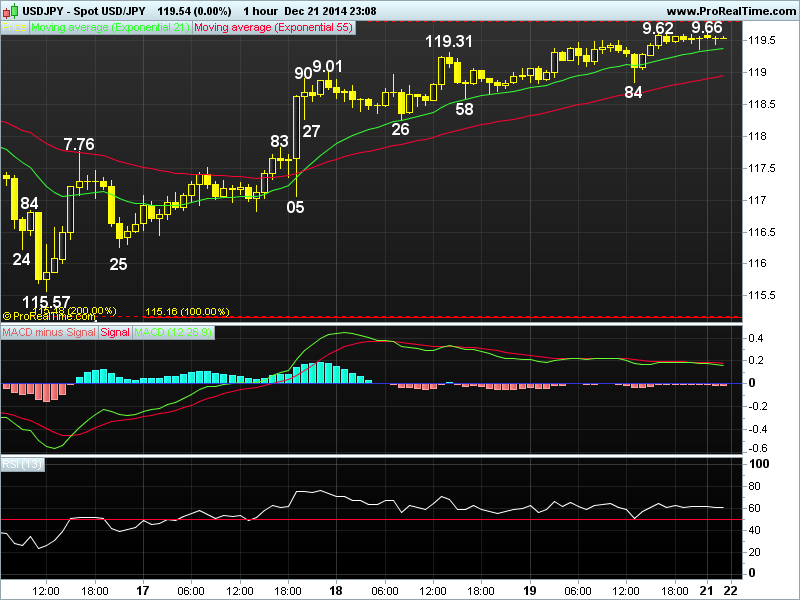 Above 119.56 would bring stronger gain to 119.93 and 120.20. 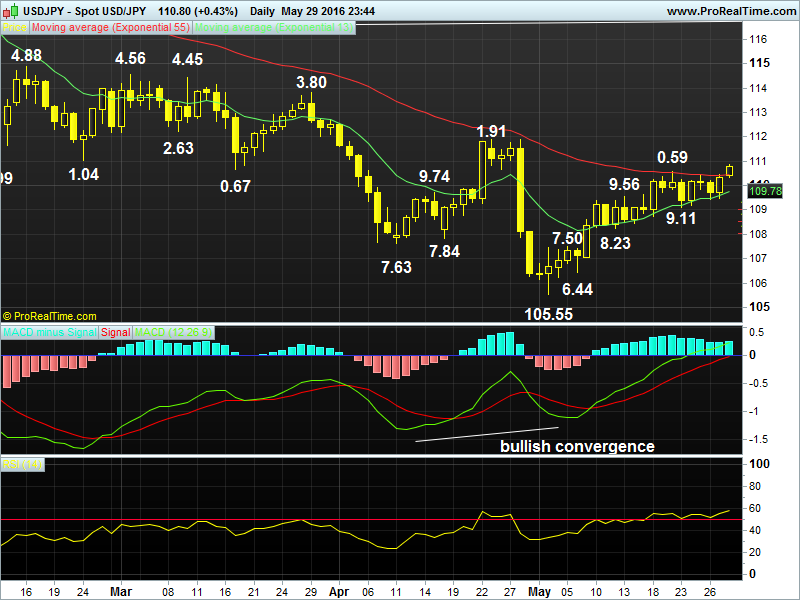 On the downside, below 118.51 would risk stronger pullback to 117.85 but support at 117.45 is expected to remain intact. [B]USD/JPY [/B]- The greenback swung wildly on Monday following the Japan’s election on Sunday. Despite opening higher to 119.04 in New Zealand yesterday, the pair tumbled to 117.78 ahead of Tokyo open and then rallied to 119.06 in Asia. U.S. dollar later met renewed selling at 118.98 in NY on renewed risk aversion due to the sell off in global stock markets. Today’s breach of last Thursday’s low at 117.45 confirms recent decline from last Monday’s fresh 7-year high at 121.85 to retrace medium-term uptrend has resumed and further weakness to 117.06 and then towards 116.40/41 is likely, however, o/sold condition would limit downside to 116.00 and bring a much-needed correction later. 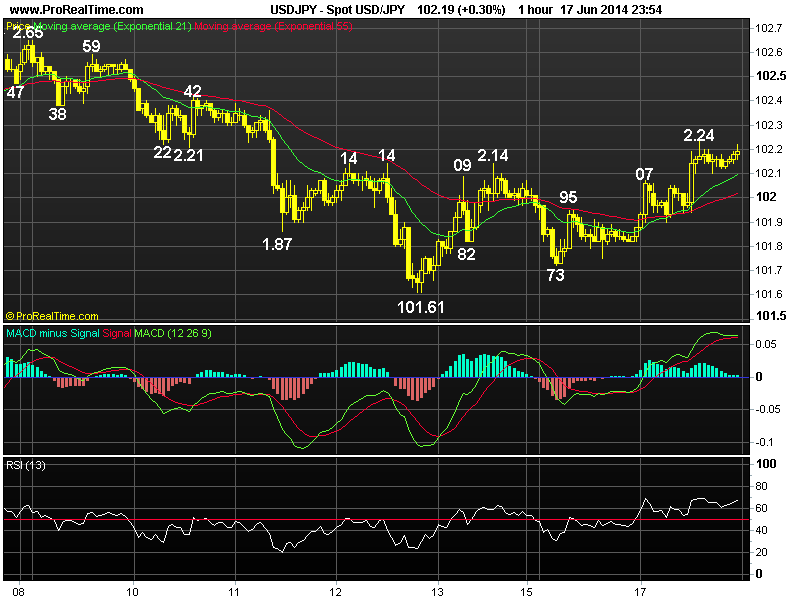 On the upside, only a breach of 118.00/01 would signal a low has possibly been made and bring stronger gain to 118.98/06 and then towards 119.56.
. [B]USD/JPY[/B] - 119.54 … Dlr swung fm loss to gain in last week’s roller-coaster session. Price met renewed selling at 119.06 on Mon n penetrated 117.45 sup due to broad-based buying of yen on risk aversion, buying interest at 115.57 quickly lifted dlr n the pair later rallied back to as high as 119.62 on Fri.
. Looking at the bigger picture, dlr’s aforesaid strg rebound suggests correction fm Dec’s fresh 7-year peak at 121.85 has ended there n consolidation with upside bias is envisaged in this holiday-shortened X’mas week, a daily close abv 120.20 (previous sup, now res) wud encourage for further headway twd pivotal res at 121.00, break wud bring re-test of 121.85, then twd 123.89 later this month or in Jan 2015, this is 50% proj. of MT intermediate rise fm 105.20-121.85 measured fm 115.57. Having said that, as daily technical indicators wud display prominent ‘bearish divergences’ on such move, reckon 125.86 (61.8% proj. fm 115.57) wud remain intact. On the downside, below 117.76 wud prolong choppy consolidation n may risk weakness to 116.25, then twd 115.57.
. Today, as long as 118.84 sup holds, up move fm 115.57 wud head twd 119.90/00, ‘bearish divergences’ on hourly indicators wud cap dlr at 120.20. Dlr’s firmness after yesterday’s rally to 120.80 suggests the correction from December’s 7-year peak at 121.85 has indeed ended at 115.57 last Wednesday and above 121.00 would extend gain to 121.34, however, aforesaid peak at 121.85 should hold on 1st testing. Raise long entry for 121.30 and only a daily close below 120.05 dampens bullishness on dlr, 119.66. Despite yesterday’s cross-inspired rebound above last week’s 119.41 high to 119.84 in New York morning, subsequent selloff to 118.76 following Fed chief Yellen’s mildly dovish testimony suggests early erratic rise from last week’s low at 118.20 has ended there and consolidation with downside bias is in store today. However, only below 118.20 would retain bearishness for recent fall from February’s 120.48 to extend to 117.90/00, loss of downward momentum should keep price above 117.62 (being 61.8% r of 115.85-120.48). On the upside, expect 119.41 to cap intra-day recovery and only above 119.84/88 res would risk marginal gain to 120.00/04 before prospect of another decline. Despite dollar’s brief breach of last Wednesday’s low at 119.29 to a fresh near 1-month trough at 119.22 yesterday, subsequent rebound to 119.98 suggests a temporary low and as long as said support holds, choppy trading with mild upside bias remains for a retracement towards 120.17. However, reckon 120.61 (previous support, now resistance) would hold and yield another decline later. On the downside, below 119.22 would signal decline from March’s near 8-year peak at 122.03 to retrace recent uptrend has resumed and extend weakness to 118.80, then 118.20. Dollar’s sell off to 119.45 yesterday after being capped below Tuesday’s high of 120.37 suggests upmove from last Thursday’s 5-week trough at 118.33 has made a temporary top there earlier and consolidation with downside bias remains for a retracement to 119.11 (61.8% r of 118.33-120.37). However, sup at 118.93 would hold today and yield rebound later. On the upside, only a move back above 120.37 would extend aforesaid corrective rise to 120.62 (61.8% r of 122.03-118.33) and then 121.00 but res at 121.20 should cap upside.